1 How to cook a turkey thigh fillets? 2 How to cook turkey fillet in Aerogrill? Turkey breast is unique in its properties. Her the meat does not cause any allergic reactions, It is a low-calorie, well absorbed by the body. The meat of turkey contains a lot of vitamins and micronutrients, cholesterol and less likely compared to other types of meat. 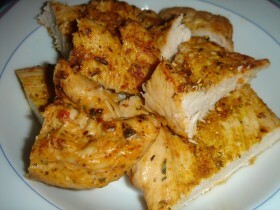 turkey breast is recommended to eat those, who wants to lose weight, as well as children. At the same time cook turkey fillet can be quickly and easily, and the dishes out of it is guaranteed to turn out tasty and healthy. How to cook a turkey thigh fillets? Meat should be cut into thin plastics. They gently kicking from both sides. Next, preparing a mixture of two eggs, milk, salt and spices. There laid out slices of meat 60 minutes. Next, the meat to be coated with breadcrumbs. Fried meat in vegetable oil on a regular frying pan. After the completion of frying needed to drain off excess fat, and the dish is ready. Washed and Dried turkey meat impregnated with saline (4 Article. l. to 1 liter of water) in the refrigerator for one and a half hours. 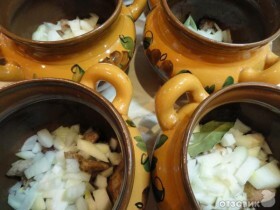 After that, the meat shallow incision in several places, incisions are placed in the garlic cloves. Since meat erased excess saline, it is coated with olive oil and spices. In order to cook turkey fillet, a selected portion of the carcass is wrapped in foil and sent in the oven, preheated to 250 °. 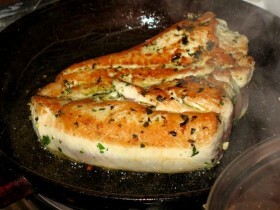 During 25 minutes, it is baked at the indicated temperature, then fire off, and fillet remains in the oven for another hour and a half to complete the preparation. Using the obtained grinder minced turkey meat. Finely chopped mushrooms and onions are fried in vegetable oil in the pan approximately 12-16 minutes. Of minced meat is tortilla, which is placed in the center of the stuffing of onions and mushrooms. formed patty, each side is coated with breadcrumbs. Fry in a pan on the need to 6-8 minutes per side. How to cook turkey fillet in Aerogrill? Meat is rotated by means of a meat grinder. The obtained minced meat is mixed with spices: black pepper, cilantro and zira, added salt. Of minced meat and fold the tube is placed on the wooden skewers. Is put on a baking foil, but it – the skewers with meat. The preheated oven 180 ° occurs roasting dishes to give a crisp appetizing. Next skewers turn over the other side. Cook turkey fillet not only delicious, but the original, It helps the following recipe. The meat is cut into cubes. Kiwi (4 pieces) peeled and cut into small cubes, too. Meat and boiled rice are laid out in the sleeve and placed in the oven. After baking sleeve unfolds, and added a dish of sliced ​​kiwi. In a similar way you can prepare this dish and multivarka. As an option, you can do the usual pan. For this first meat and rice fried in vegetable oil for 25 minutes, and then added on top of kiwi.